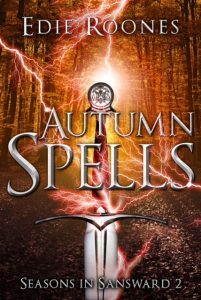 Scary October needs a scary witch, and the fantasy Autumn Spells by Edie Roones offers us Neehla. Eager to re-embody herself in a younger woman, Neehla builds her sorcerous spell. In this life her name was Neehla. Over many lives, she had lost some things, gained others. Through them all, her sorcery remained tangible evil, woven from the elemental air and the incense of her spells. Her fingers flew across the loom, weaving a snare for the unwary. She snatched a spiral of smoke from the air and twisted it deftly before joining the sorcered strand to the thread on the shuttle. As it shot across the warp threads on the loom, the gray smoke deepened, becoming as darkly hued as the power that shaped it. Honor and death? Or cowardice and life? Stark choices, and not that easy. arrival of the Watrani horde, allied with the Gitane Witches, changes the world she has known. The Witches are sorcerers who have been exiled from Sansward for generations. Beren’s keep lady orders her to protect the Eye, a magical crystal that increases a wielder’s power. Besides the magnification of power, the Eye has two other important purposes: 1) It can remove the curse that transformed the fighting Prica warriors into wolves. 2) It will free sorcerers who were trapped in stone at the end of the Great War between the mages and the witches. And the Gitane Witches are searching for the Eye. Lady Treasache intends to steal away with the Eye in a desperate bid to keep it from the Gitane. The Prica Storr thinks to use the Eye to shift back into man. Will Beren sacrifice herself in a futile attempt to guard the Eye? 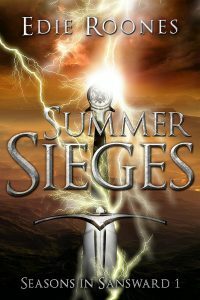 With only a sword as defense against sorcery, can she survive a battle against the Gitane? Or will she discover that the road to death is littered with people who chose honor over life?